LOCH SHELDRAKE, NY (November 11, 2013) – Puccini’s “Tosca” was the presentation for the Live from the Met in HD series on November 8, 2013 at Sullivan County Community College in Loch Sheldrake. Borrowing from Wagner’s innovations, Puccini used leitmotifs to identify characters, objects and ideas. Borrowing from Debussy, Puccini successfully incorporated impressionism into Italian grand opera. Both these borrowings, added to Puccini’s innate dramatic-musical compositional inventiveness, resulted in a score so powerful, that the opera always seems fresh and exciting. To wit – it has had almost 1,000 performances since 1900 at the Metropolitan Opera. Within the present ocean of operas from the Met, questionable for either their updating of situations without updating the librettos to make dramatic sense, or with the presentation of operas that may stand out musically but lack dramatic cohesiveness due to contrived and outdated, convoluted librettos, “Tosca” is VICTORIOUS in keeping the art of music-drama alive and well. 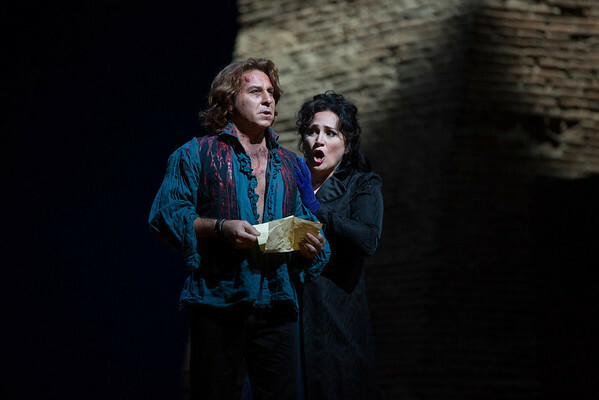 Though the merde floated a bit into this production of “Tosca” – three unwarranted harpies lolling about Scarpia’s “office” while he is supposed to be talking (singing) to his political male cohorts, and a very unexciting, contrived and incomplete suicide – soprano Patricia Racette, tenor Roberto Alagna and baritone George Gadnidze gave us perfectly honed interpretations of their roles in this superb character-driver plot with their expressive singing and strongly communicated emotions. I may not have seen Tosca 900-1000 times, but it must have some kind of magic in order for me to be highly moved watching a plot that I have seen numerous times unfold with suspense, and even with some hope that it will have a happy ending. One positive new innovation since the introduction of Live from the Met in HD series began is the listing of the entire cast in the program. This is the first time the comprimario singers (minor roles) have been given their due in the program. I hope that will be a permanent fixture from now on. 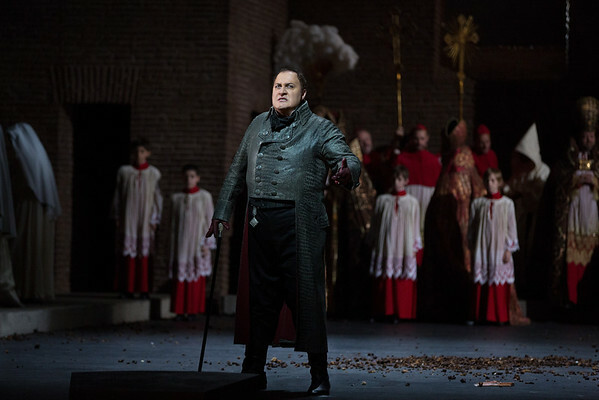 The next opera in the series is Verdi’s Falstaff, conducted by James Levine, on December 14. For information: 845-434-5750, ext. 4472.